Increase website traffic fast: There are so many traffic driving tricks available over online. You know that increasing blog traffic is not an easy job for the first time. You need a lot of hard work and great traffic plan for getting more website traffic. Without proper knowledge of promotional and marketing strategies you can not achieve your desired goal. It is especially hard job for every newbie blogger and webmaster to increase website traffic for the first time of his/her blogging life. Generally, you know that creating blog is easy but maintaining is not too easy as you predict! However, nothing is hard for human being in the world if they want and take appropriate action! But here is an advisable sentence that- do anything ethically nor you will get penalty for sure! You can increase your website traffic in many ways but all methods will not give you guaranty to get traffic over long period of time. Especially all kind of black hat methods. So, without wasting your time let’s go through these 10 surefire ways to increase website traffic! 1. Brainstorming keyword research: Keywords are the main key of your blog to increase traffic. If you make any wrong while selecting your blog related keyword then it will suffer you for long time to recover this great problem. So, take time to research keyword and do brainstorming idea to find valuable keyword for your blog to get good blog traffic. There are too many online tools available for researching keywords. I do keyword research by Adwords Keyword planner Tool. It is a great tool you can use to get good information about your desired keywords like search volume, keyword competition, keyword CPC and too many valuable data! If you face any problem with keyword research, then comment below now and I will do it for you free! 2. Technical On page optimization: After finding good keywords then it is time to implement keywords by optimizing on page SEO. Proper optimization is very useful for SERPs ranking. On page optimization is very effective for ranking your blog on the top of search result, as a result you can get good numbers of visitors if you can obtain first page ranking. 3. Spread out the world: After publishing post do not sit back. You know that in the online era there are more competition. Like as you there are many bloggers and web masters are competing with you. So, get connected with different social media platforms. Like Twitter, Facebook, StumbleUpon, LinkedIn, Google+ and share your blog with million of online users. Make sure to go your blog viral and grab the attention of your audience. 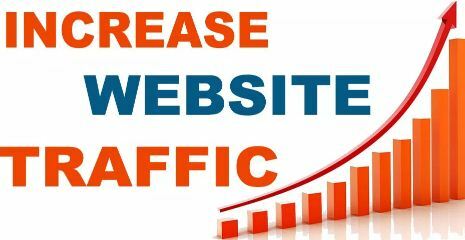 By this way you can get unlimited traffic as well as you will able to increase website traffic easily. 4. Relevant blog Comment Power: Related Blog commenting is a great way to increase website traffic. So, comment on others blog and make interesting comment to attract blog author as well as other readers. But, do not put irrelevant comment. You can easily find many blog related to your blog topic by the help of Google. Type your niche in the section of keyword and search on google to find related blog on your niche to comment on. Always mind, do not spam! 5. Participate in Q&A sites: Q&A sites means Question and Answer sites where people ask question or answer others question like- Yahoo answer. So, you can also participate in your topic related discussion and help others by answering their question. Here is a little trick is, present yourself as a smart guy and make your answer interesting as much as possible and do not forget to put your blog link in resource section! Simple and Super effective ways to Drive more traffic to your blog or website Fast. 6. Pay Per Click Advertising: Yes, it also a great way to increase website traffic by PPC Advertising. If you have some budget you can try these techniques like Google Adwords, MSN Adcenter and Yahoo etc! By implementing PPC Add you can get huge traffic to your blog. Do not forget to track the results regularly. Take a chance if you want to get more exposure for your business. 7. Do not forget SEO: SEO means search engine optimization. It is one of the most useful ways to increase your website traffic. If your website is new you can do SEO yourself without spending huge budget! Lear the proper techniques of seo and do seo in your website to get more search engine traffic completely free. Two kinds of SEO are- On page SEO and Off page SEO. Firstly do on page seo correctly by following 10 Best On page SEO Techniques. And then, do off page SEO for your site. Read this article if you want better solution- 6 Top working off page seo Techniques. Actually, there are more works on off page seo like, social bookmarking, forum posting, press release submission, article submission directory submission, relevant blog comment, guest post and so on all are link building methods. 8. Join Different online communities: By joining online communities you can get more blog traffic also. These communities are generating great number of traffic regularly. There are so many active members are on these communities. So, you can also join these communities and create account and start to engage other members to attract them to come on your blog. You can join these popular blogging communities like- Blog Engage (Premium), BizSugar (Free), IndiBlogger (Free), Klinkk (Free), InBound (Free) etc. 9. Technical video Marketing: Video marketing is also a popular method to increase website traffic now days. Bloggers and webmasters are taking awesome advantages from video marketing. You can also do this. Make interesting video related your blog topic and upload on video sites like- You tube. Put your website link on video description also. So if people find your video helpful they will also visit your site by this link. Thus way you can increase website traffic freely. 10. Update website regularly: Update your blog regularly to index quickly. Search engine do not love those sites do not update often. Your blog readers will also decrease if they do not find new content. If you want to rank quickly and grab the attention of readers you must update your website regularly. So, write at least 2-3 post weekly. Or, you can add some on your old post and update post if you are not able to write more post in short time. There are more techniques you can follow to increase your website traffic fast. If you are new in blogging you can give a try for first time. I think it will give you best results for your online business and so on! If you find this post helpful do not forget to share it with your friends. If you face any problem let me know it by commenting below. I will try my best to help you. Keep visiting for latest traffic tricks to increase your website traffic. Happy blogging. Thanks for your wonderful information about how to drive traffic to any website. Website analysis is important for anyone to know about their strengths and weaknesses in website. Howdy very nice web site!! Guy .. Beautiful .. Amazing .. I will bookmark your website and take the feeds additionally…I’m satisfied to seek out a lot of helpful information here within the put up, we need develop more strategies in this regard, thank you for sharing. Thanks for the good read. I subscribed to your blog so i can be updated with new upcoming post.You have alot of useful SEO Advice that i will be putting to good use. foreseeable future. I want to encourage that you continue your great writing, have a nice day! Quality articles is the key to invite the visitors to pay a quick visit the web site, that’s what this site is providing. I will bookmark your blog and take a loook at again right here regularly. It is as you study my head! You seem to learn considerably roughly this kind of, just like you wrote the ebook in it something like that. I believe that you just may utilize a few per-cent to be able to force the material home slightly, but instead of this, that is superb blog site. An excellent examine. I am going to easily be rear seo. Getting more traffic has been everyone’s challenge today. Because no traffic means no sales. If you are blogging for a hobby, it does no matter to drive more traffic to your site because you simply won’t care if someone reads your blog or not. You just need a personal space to share your thoughts and ideas and you’d be happy. Not for marketers like us. Web traffic equals to making a living, quitting 9-5 job, and replacing it with a life that promises freedom, financial success, and so many other virtues of having your own business. So, these tips shared are definitely not to be missed by smart marketers. I have also created a similar blog post on creative ways to get free traffic to your site. Please click to visit my site to learn how I drive over 300 visitors a day from natural (free) searches. Where else may just I am getting that kind of information written in such a perfect way? Nice post. I had been examining frequently this kind of website that i’m encouraged! Incredibly useful information and facts precisely the supreme component 🙂 I maintain like details a lot. I became trying to get this kind of information and facts for a number of years. Thanks and also enjoy. good are all those whistles and bells doing if nobody’s even visiting your website? bone up on your abilities. busted links or pages. Broken links prevent consumers from navigating your site. Broken pages are worse, given that then the material is just missing. can present an opportunity to enhance in the rankings, so make certain that you’re always saving files with keywords. you need to want your customers to see first. page. By doing this you can push to the top of the list much simpler. effort. What is very important is that you take the ideal strategy. As you discover SEO, you will discover that a couple of small tweaks can relate to big results. Get going on your optimization using what you’ve learned here. Thanks for dropping your comment here! Definitely it is very good to focus on long-tail keywords. And adding forum on website is also a good idea to increase website traffic. Yes, we can also increase our site traffic by starting facebook group, facebook page etc. It can help us in many ways to drive more traffic to our site. However, thanks for adding more value in this post. Would love to see you again on my blog! These article is very helpful for beginners. Also I suggest you some methods to increase website traffic. You have to focus on long tail keywords, start a forum on your website because forum can quickly begin ranking for long-tail keywords, also you can start a facebook group that drives traffic to your site, submit blog posts. We also need to make our site mobile friendly to increase traffic to our site. Thanks for adding more value in this post. Nice tips to increase traffic, If you got a blog which is related to your topic then you can edit that old post & make it new then post again it is also one of the best way. Also make your site mobile friendly so that it will load faster. Thanks for sharing this article. This are really useful techniques specially for beginners, this will definitely help to increase website traffic but as well as you should measure website performance. So that you need analytics try Gostats. It works better then GA. Yes, increasing website traffic is not an easy job. You need work hard to gain this. Well, I will try most what you said. I forgot some thing- send your web URL via mail.